North London should not just be known for the fantastic little independent coffee shops, gift shops and ice cream havens popping up - even nurseries are noteworthy! The Spanish Nursery (TSN) at Ingestre Community Centre may be one of few private nurseries who have their own chef on staff preparing wonderful meals using seasonal ingredients. Valentina has been with the nursery since day one. Food is an important issue for everyone at the nursery; the directors, teachers, parents help with making things work and Valentina brings it all together enthusiastically! For us food is a good moment for sharing as a family, for sitting together and then very typically Spanish as a precursor to the siesta (nap time)! At TSN we value the food as an important part of a child's nursery life. We include a variety of cultural foods in our menu and celebrate the wonderful diversity in our nursery. To celebrate Halloween, Valentina prepared Spider vegetable Soup which had a giant spider image floating (red pepper legs and olives as eyes), mummies in blankets (her fun take on sausage in blankets). Just recently she prepared an Asian menu to commemorate Chinese New Year. To reflect the Spanish culture we often serve tortilla de patatas, paella, sopa de lentejas (lentil soup) and ensalada de garbanzos (chickpea salad). Having a good relationship with food from a young age has been shown to help children become healthy adults. It is incredibly important for us at the nursery to introduce the children to tasty nutritious balanced food and to successfully manage fussy eating issues that are so prevalent with little ones. Water and milk are the only drinks we offer in the nursery and fresh salad and / or steamed vegetables are included in the menu every day. Our approach to healthy living incorporates wider elements which surround the healthy, nutritious and balanced home-made meals. Dental hygiene is promoted by every child having their own toothbrush, toothpaste and hand towels. The children brush their teeth daily after lunch. Rest time (la siesta) is recognised and promoted as an important element in children's lives. At TSN every child has their own child size cot, linens and blankets and we include rest time in the day to day routine. Daily physical exercise is also promoted through use of the garden (regardless of the weather), weekly trips to the library, outings to the local parks, etc. We involve children in gardening and growing their own fruit and vegetables and have grown strawberries, potatoes, carrots, tomatoes and then eaten them. 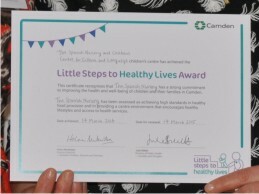 Consequently, TSN was recently given the Little Steps to Healthy Lives Awardby Camden Council in recognition of the work done to promote consistent, evidence-based health messages and for having the foundations in place to support children's and families' health and well-being. 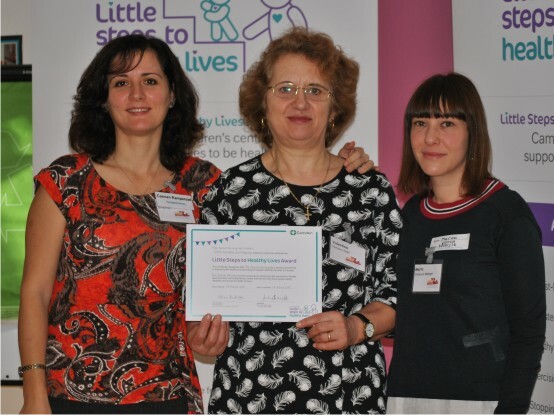 A nursery chef not just a cook makes The Spanish Nursery a destination location in North London and well worth a visit!